Belton, Texas – The University of Mary Hardin-Baylor football team held its ground as the Cru is ranked #2 in the country in the two major NCAA Division III Top 25 Polls again this week. The Cru (3-0, 2-0 ASC) is coming off a 47-14 victory over Texas Lutheran University last Saturday. It was UMHB’s 25th consecutive regular season victory. The Cru is ranked #2 in the country in the second American Football Coaches Association Top 25 Poll of the 2018 season. The Cru received seven first-place votes and 1,255 total points from the AFCA. Defending national champion Mount Union holds down the #1 spot with 45 first-place votes and 1,293 total points. St. Thomas (MN) is ranked third, Brockport (NY) is ranked fourth and North Central (Ill.) rounds out the top five. Upcoming Cru opponent and American Southwest Conference rival Hardin-Simmons University dropped one spot to #7 in the AFCA poll with 972 points. East Texas Baptist totaled 17 points to give the ASC three programs receiving mention. UMHB also held on to the #2 spot in this week’s D3football.com Top 25 Poll. The Cru took two first-place votes and 600 total points. Mount Union is also #1 in that poll and the other three teams in the top five match the AFCA ranking. 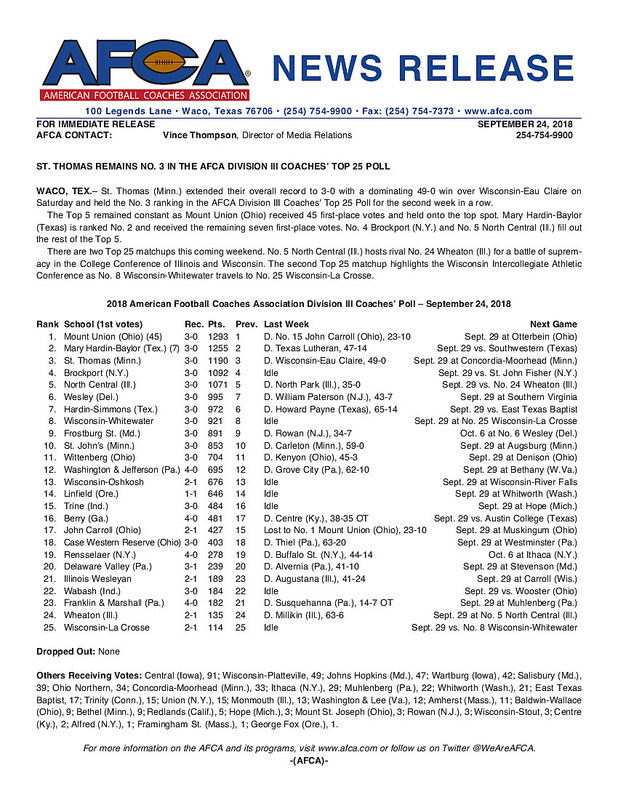 Hardin-Simmons is ranked eighth by D3football.com. The Cru will return to action with the 2018 home opener against Southwestern University this Saturday. The two teams will face off in a 6 pm kickoff at Crusader Stadium. The Pirates are 2-2 overall and 1-2 in ASC play on the season.